Welcome to our weekly storytime blog post. This week’s theme is Bears. From cute and cuddly teddy bears, to big, brown and cranky bears there is sure to be a book about bears you would love to share. You may even like to go on a Teddy Bear’s Picnic. This picture book is based on a traditional children’s action rhyme and is retold here by Michael Rosen. There’s nothing to be scared of as you join in the bear hunt crossing a field of long grass, wading through a deep cold river, squelching through mud, making your way through a forest, passing through a swirling snowstorm and tiptoeing into a narrow cave. Not until you come face to face with a big brown bear anyway! In the Jingle Jangle Jungle on a wet and windy day, four small friends meet up with a very cranky bear. Which of these four animal friends will save the day. Will it be Zebra and his fantastic stripes? Will it be Moose with his marvelous antlers? Will it be Lion and his golden mane? Or will it be Sheep who is so very plain? Find out when you read this fun and humorous story written by Nick Bland. Join Ruby as she tells us a tale that most definitely does not have any bears in it. Not even one! Or does it? According to Ruby the most important thing about this book is that there are no bears in it. Ruby is tired of bears and you don’t need bears for a book. But who saves the princess? Is it the fairy godmother or was she saved by a bear? You be the judge. 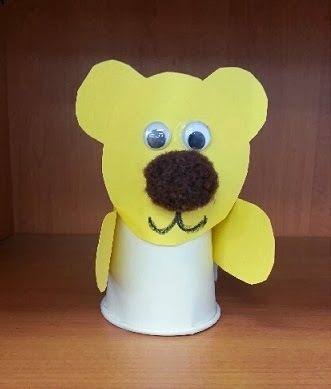 Children will develop their fine motor skills making this easy craft. Simply cut head, arm shapes and two ears out of craft paper. Glue ears, wiggly eyes and a pom pom nose to the face. Draw a mouth with a black marker. Glue head to the paper cup as shown in the picture. Glue or tape arms to the side of cup. If you can recommend any picture books, rhymes, songs or craft ideas about bears we would love you to share them with us.